Conditions that can induce heat stroke (also called sun stroke) and heat exhaustion include stagnant atmospheric conditions, poor air quality, and high temperatures. Consequently, people living in urban areas may be at greater risk from the effects of a prolonged heat wave than those living in rural areas. Asphalt and concrete store heat which gradually releases heat at night, producing higher nighttime temperatures (urban heat island effect). What to do before an extreme heat emergency. Consider the following preparedness measures when faced with the possibility of extreme heat or heat stroke. Install temporary window reflectors (for use between windows and drapes), such as aluminum-foil-covered cardboard, to reflect heat back outside and be sure to weather-strip doors and sills to keep cool air in. Cover windows that receive morning or afternoon sun with drapes, shades, awnings, or louvers. Outdoor awnings or louvers can reduce the heat that enters a home by up to 80%. Consider keeping storm windows up all year. What to do during extreme heat or a heat wave emergency. 1. Stay indoors as much as possible. Circulating air can cool the body by increasing the rate of perspiration evaporation. 2. Eat well-balanced, light, and regular meals. Avoid using salt tablets unless directed to do so by a physician. 3. Drink plenty of water regularly, even if you do not feel thirsty. Persons who have epilepsy or heart, kidney, or liver disease, are on fluid-restrictive diets, or have a problem with fluid retention should consult a doctor before increasing liquid intake. 4. Limit intake of alcoholic beverages. Although beer (which is mostly water) and alcoholic beverages appear to satisfy thirst, they actually cause further body dehydration. 5. Never leave children or pets alone in closed vehicles. 6. Dress in loose-fitting clothes. 7. Protect face and head by wearing a wide-brimmed hat. 8. Avoid too much sunshine. 9. Avoid strenuous work during the warmest part of the day. Use a buddy system when working in extreme heat and take frequent breaks. 10. Spend at least two hours per day in an air-conditioned place. If your home is not air conditioned, consider spending the warmest part of the day in public buildings such as libraries, schools, movie theaters, shopping malls, and other community facilities. 11. Check on family, friends, and neighbors who do not have air conditioning and who spend much of their time alone. First Aid: Take a shower using soap to remove oils that may block pores, preventing the body from cooling naturally. If blisters occur, apply dry, sterile dressings and get medical attention. Symptoms: Painful spasms, usually in leg and abdominal muscles. Heavy sweating. First Aid: Get the victim out of the heat and to a cooler location. Lightly stretch and gently massage affected muscles to relieve spasm. Give sips of up to half a glass of cool water every fifteen minutes. Do not give liquids with caffeine or alcohol. If nauseous, discontinue liquids. Symptoms: Heavy sweating; skin may be cool, pale, or flushed. Weak pulse. Normal body temperature is possible but temperature will likely rise. Fainting or dizziness, nausea or vomiting, exhaustion and headaches are possible. First Aid: Get victim to lie down in a cool place. Loosen or remove clothing. Apply cool, wet cloths. Fan or move victim to air conditioned place. Give sips of water if victim is conscious. Be sure water is consumed slowly. Give half a glass of cool water every fifteen minutes. If nausea occurs, discontinue. If vomiting occurs, seek immediate medical attention. Symptoms: High body temperature (105 plus). Hot, red, dry skin. Rapid, weak pulse and rapid, shallow breathing. Possible unconsciousness. Victim will likely not sweat unless victim was sweating form recent strenuous activity. 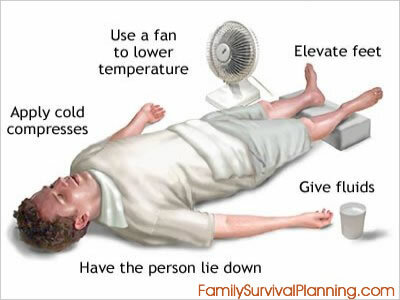 First Aid: Heat stroke is a severe medical emergency. Call 911 or emergency medical services or get the victim to a hospital immediately. Delay can be fatal. Move victim to a cooler environment. Remove clothing. Try a cool bath, wet sponge, or wet sheet to reduce body temperature. Watch for breathing problems. Use extreme caution. Use fans and air conditioners.